Mobile Crew Management Just Got Better! 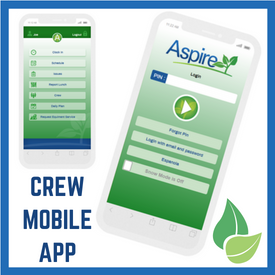 If you want a mobile app that seamlessly ties together estimates, services, schedules and inventory to get real time job costing and service management—look no further than Aspire! Manages hours, materials and equipment. Dynamic and real time updating of schedules. If you’re attending the GIE+ Expo, be sure to check out Cocktails with Champions and learn about Five Technologies that will Change Your Business. RSVP now by clicking here.